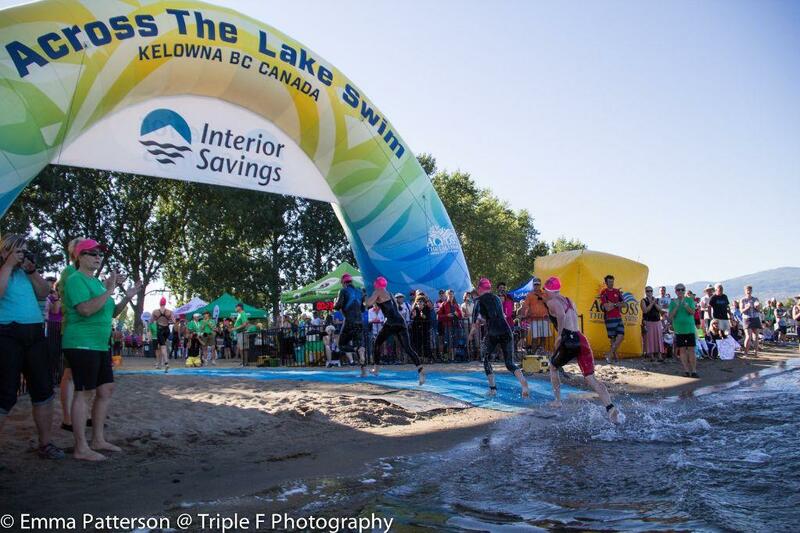 The Interior Savings Across the Lake Swim Kelowna is Canada's largest and longest running open water swim event. Starting in 1949, the swim was once used as a rite of passage for local swim clubs and was a major part in the Kelowna Regatta. The swim has become more of a bucket list item with friends and families challenging themselves to swim the 2.1km distance across pristine Okanagan Lake. Recently we were thrilled to be recognized as one of the top open water swims in the world! The swim starts at the Old Ferry Wharf in West Kelowna and ends at Hot Sands Beach in City Park, Kelowna. The swim is a point to point straight line course with easy sighting. All participants are bused to the start line which is included in your registration fee. The water temperature in July averages between 19-23C is usually calm and the finish line is clearly visible from the start line. Your registration includes FREE Fresh Air Open Water Swim Clinics that take place every Saturday for 6 weeks before the swim. Also included is our award winning beach towel, a souvenir swim cap, a numbered event cap, a gear bag filled with swag, finish line food, insurance, a bus ride to the start line, photo booth at the finish line and the thrill of swimming across Okanagan Lake!